Solitude (7 x 6 inches), intaglio with Toyobo digital plate. The third process studied in contemporary print processes consisted in using a Toyobo digital plate. In this instance, two plates were required for the print, one being a Toyobo aluminum plate for the digital image and the other a copper plate for the etched image. The Toyobo plate is a light-sensitive pre-coated aluminum plate on which I exposed and developed a reworked digital photograph that I took of a subway train door in the Montreal metro. 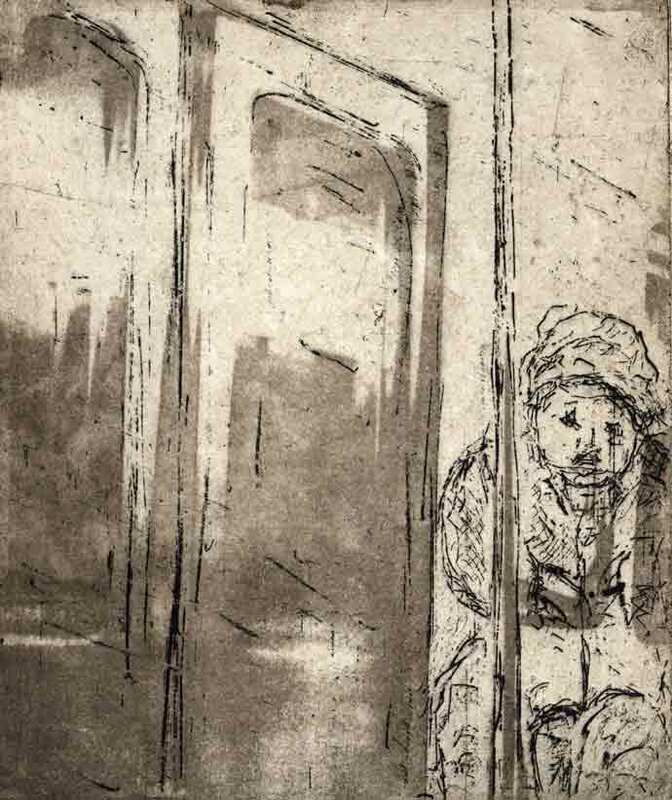 On the copper plate coated with hard ground, I drew with an etching needle the figure and contours of the door freehand and etched the copper plate in acid. This being a two plate process, the Toyobo plate was inked and printed first and, as the paper was still under the roller of the press, the copper plate was inked and placed under the paper and run through the press a second time. Working with the Toyobo aluminum plate is relatively easy as compared to handling the flimsy Puretch film. Its main disadvantages, however, is that the aluminum plate cannot be reworked or etched in acid and that the image on the Toyobo tends not to print as strong as the etched image from the copper plate.